After blanking in the first match, I needed a decent result today or my league was over before it started, I got to the pub for the draw and saw Rob had pegged Isle Brewers again but had also put a few pegs in at Hambridge, they were full of fish at the end of last season but I thought it might be a bit early yet. We had another new face fishing today as Harry Hebditch was joining us for the first time, we’d spoken on Facebook a few times but it was nice to finally meet him in the flesh. Harry is a farmer and has a cracking looking lake on his land so hopefully he’ll let us fish it at some point. Hurf was sporting a rather fetching new fishing hat which he hoped would bring him luck! Hurf had his new lucky hat on today! 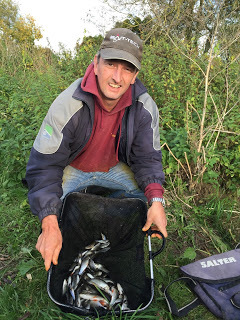 Looking at the section sheets, Rob had given anglers a choice on several pegs (which I think is a really good idea) although I didn’t fancy 123 where I was last match much and having the choice of 122 didn’t really appeal either! 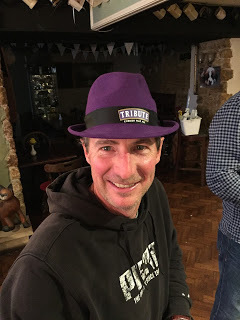 When Rob announced the draw I decided to hang back and see if someone else drew it and after a couple of people had pulled pegs out of the hat, Fieldy did just that for me – cheers mate! Hurf was happy as he’d drawn 125 and he also had the choice of 124 (so maybe his lucky hat was working already) and when I opened my hand, I was the next peg downstream, 126, a great peg but now I had to try and do it justice! I had a quick chat with Justin who was second off it last week, as there are two places you can fish the peg and he said he’d sat upstream of the bend. I got to the river and dropped my kit off at the top of the swim before having a look at the bend, the river was still painfully low and clear and we need some rain desperately. I decided to fish at the top of the swim as it looked really nice with two branches in the water down the peg. I walked back to the cars to let Hurf have his bait and he was concerned he hadn’t seen any fish move and he could see right across the peg, he still wanted to have a pound side bet though! I got back to my peg and I have to say once again what a cracking job they’ve done cutting out the swims, I was able to get my box quite low to the water and there was plenty of room. 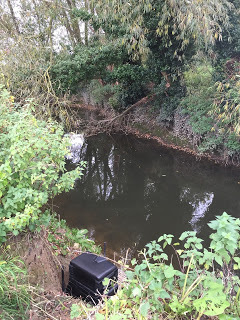 The main flow was on the inside and I set up a 0.6 gram DH16 for running through and after plumbing up there was a deeper hole in the slacker water at 8 metres and I set up a 1 gram bodied float for there. Lastly I set up a 13 foot float rod with a little 2AAA Drennan Crystal Waggler which I hoped wouldn’t spook the fish in the clear water. I shotted it up with just a couple of number tens down the line and all three rigs had 0.12mm hooklengths with size 18 Kamasan B611’s. 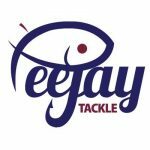 When I picked up the bait from Tackleuk yesterday I also bought some of the new Drennan Aqua F1 and Silverfish Bungee elastic. 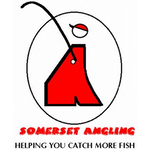 Rated 4 to 6 it looks perfect for roach fishing at Dillington and hopefully it would get a decent work out today (although I think there would be some raised eyebrows if I weighed in any F1’s today!). 10:30 arrived and I started on the waggler, fishing in the flow with a single caster on the hook and feeding maggots, casters and hemp. Much like last week I was into small chublets, dace and gudgeon straight away and the swim was obviously full of fish as wherever I cast the float it would go under but nothing over an ounce. After an hour I had 24 fish but probably didn’t have much more than a pound in the net. I tried the pole with the lighter rig but that just resulted in more small fish so I tried the heavier float in the deeper water and first chuck the float buried and a better 4oz roach was the result, a couple of smaller roach followed before it was back to chublets and gudgeon. Back on the waggler and I added a few inches to the depth and had a better roach, the float sailed away on the next cast as well but this time I struck and it was solid before the fish woke up, tore off and snapped the hooklength like cotton – bugger! I’m pretty sure it was a chub and it would have been a nice bonus. After tying a new hooklength on I carried on catching small fish but that lost fish played on my mind. 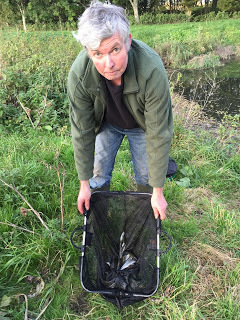 Stu Alford turned up for a walk round and said Hurf was catching a fish a chuck but they were mostly gudgeon. After the second hour I’d caught another 20 fish but I wasn’t sure I had 2.5lb yet and unless the stamp of fish improved (and I stopped losing chub! ), I would be a long way short of my 10lb target. 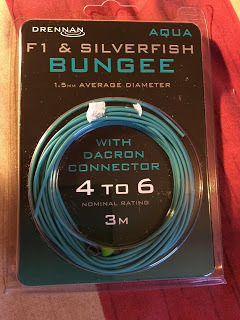 As the halfway point approached I had lost my way somewhat and was swapping between all three rigs and catching fish on all of them without putting a great deal of weight in the net. There were loads of decent fish topping below the two branches in the water but despite running the waggler right down the peg and fishing the pole at 11.5 metres and holding back by the branches, all I could catch was more gudgeon and chublets. I tried upping the feed to see if I could bring the fish up the peg but they wouldn’t budge and I couldn’t help thinking I’d have done better if I’d sat on the bend. 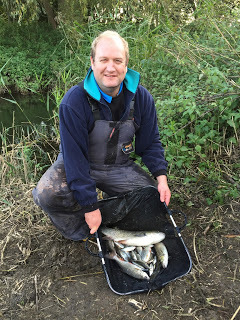 I carried on catching small fish but in an almost carbon copy of the last match, as the day wore on the ratio of gudgeon to chublets/roach/dace increased and those gobios just don’t weigh very much. Unlike last Sunday, this week I didn’t have a last gasp chub (I fluffed my chance earlier!) but as I had more fish, I hoped I’d done a bit better than then. I ended up with 125 fish plus a few minnows which I didn’t count. Gordon arrived with the scales and I was really disappointed when I only weighed 6lb and felt I’d cocked up a flier today. Gordon had struggled in 128 for 1lb 1oz and then as we walked down to weigh Justin in on 129, he was admitting to double figures but when he pulled his net out he had loads of quality roach and a big chub and after two weighs, his total was 23lb 4oz, a fantastic bag of fish, well done mate. He also said it could have been more but he suffered a fair bit of pike trouble throughout the day. As we walked back to the cars we met Fieldy who weighed 5lb 1oz and Hurf who had 3lb 2oz (so his hat wasn’t that lucky after all!) which meant that as long as Justin framed I should win the section. Back at the results and Hambridge hadn’t fished very well at all with Rob having the top weight of 5lb 3oz, so I actually ended up in second place and picked up £30 plus nuggets from Hurf and Steve P who actually won the bottom section with 1lb 15oz. The other two down there had struggled a bit, Karl had 9oz and Harry had 12oz but he said he enjoyed it and is coming again next week. So for the second week on the trot I can honestly say I’ve had a bite every chuck and all those small fish bode well for the future. Considering how low and clear the river is, it’s fishing well, if we get some rain I think it will fish its nuts off! I’m still really enjoying The Big Fish on BBC2, they were in Cuba this week and fishing for those bonefish looked exhilarating and as for those tarpon, what amazing creatures. I have to say I wasn’t so keen on the rubber ring challenge but it was still quite interesting. They go to Laos next week and I bet they’ll encounter some weird and wonderful species there.